Israeli forces have raided a building in Ramallah where the offices of several media outlets, including RT’s Arabic channel, are located. The IDF raided the Palmedia company building in the West Bank city overnight on Friday. 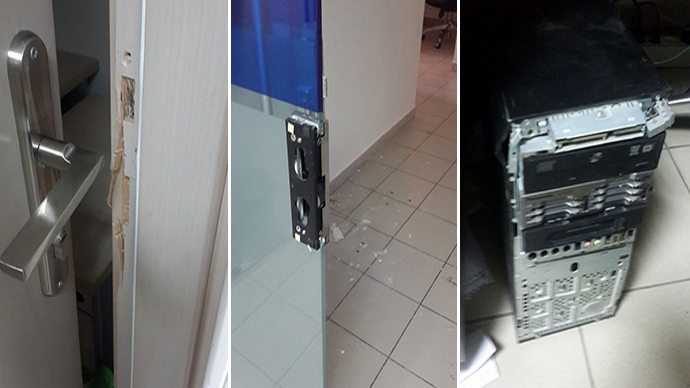 The troops broke down the doors of several offices, destroyed some of the equipment and confiscated records, RT’s correspondent Yafa Staiti reported. “Due to the actions of the military there is no Internet connection in the office. We’ve lost the archive of video footage and other materials. Office furniture and computers have been damaged,” she said. Israel’s military command explained that the night raid did not specifically target RT, but the lessor of the office, which is suspected of cooperating with Hamas. “The operation was aimed against the Palestinian company, Palmedia. The reason is that it provides services to Al-Aqsa TV, which has propagandist and inflammatory content. That’s why the search was performed there,” the representative of the Israeli military command told RIA-Novosti news agency. “RT considers the intrusion into its office in Ramallah as unacceptable, coming under false accusations that Palmedia is cooperating with the Hamas political party,” it added. Later, the IDF told RT that its soldiers entered the Palmedia offices in Ramallah, and confiscated hard drives and other items used to operate Al-Quds television station. "The Al-Quds station serves as the mouthpiece of the terror organization and regularly is used to encourage recruitment, terror acts and fundraising for Hamas," the IDF said, adding that "these confiscations were done as part of Operation ‘Brother's Keeper’ to rescue three Israeli teenagers that were kidnapped over ten days ago by Hamas." The search for Naftali Frankel (16), Gilad Shaer (16), and Eyal Yifrah (19), dubbed Operation Brothers’ Keeper, intensified on Sunday morning. According to IDF officials, the military has searched 1,400 different sites since last week in hopes of recovering the teens, which Israeli Prime Minister Benjamin Netanyahu announced had been kidnapped by Hamas. 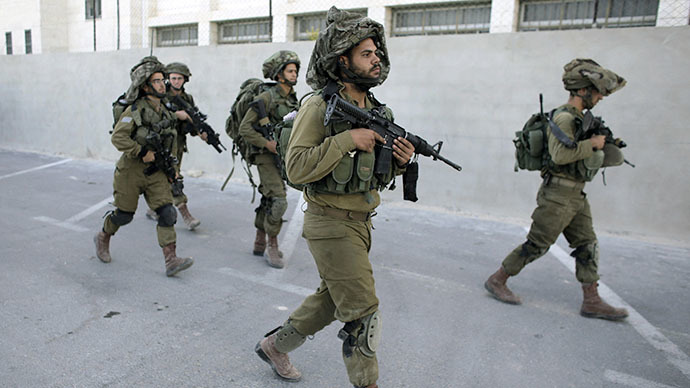 The IDF says over 350 Palestinian Arabs – many of whom are active in the Islamic resistance movement Hamas – have been arrested since the operation began last Friday. The Israeli military has closed most of the Hebron region and sealed off crossings into Gaza as the search for the missing teens goes on. Also, they have banned West Bank men under 50 from traveling to Jordan through Allenby Bridge. On Saturday night, nine more suspects were detained after Israel operations kicked off in the Ramallah district of the West Bank. Two Palestinians were shot and killed during clashes in Ramallah and Nablus overnight Sunday, while 25 more were reportedly injured. In Nablus, 36-year-old Ahmad Said Suod Khalid was reportedly shot dead in al-Ein refugee camp while reportedly going to mosque for dawn prayer. 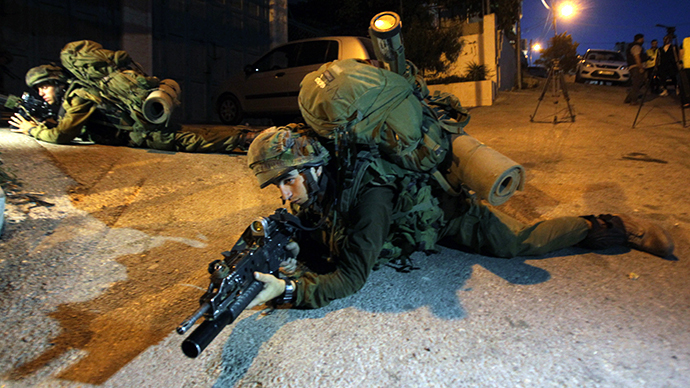 The suspect began to approach a base "in a threatening manner," an IDF spokesman told AFP Sunday morning. The IDF said he failed to respond to warning shots fired in the air, and they therefore fired at him. "Initial inquiry suggests that the suspect was mentally unstable," a military statement said. Eyewitnesses, however, told Ma'an news agency the soldiers had asked Khalid to go back home. Khalid reportedly refused the order and continued walking to the mosque, at which point a soldier reportedly pointed his rifle at him and shot him several times from point-blank range. The other victim, identified as Mahmoud Ismail Atallah, was reportedly killed during the Ramallah clashes. Sunday's deaths brought to four the number of Palestinians killed since Israel launched search operation in the West Bank. 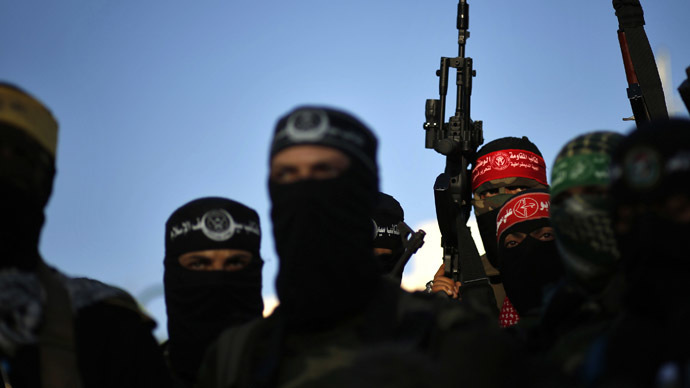 Hamas has vowed to “open the gates of hell” by launching a third Intifada or uprising if Netanyahu carries through with his threat to expel Hamas’s leaders from the West Bank to Gaza. The second Intifada, which raged from late September 2000 to February 2005, resulted in the deaths of an estimated 3,000 Palestinian, 1,000 Israelis, and 64 foreigners. Meanwhile, The IDF's raid on the Palmedia building is not the first time it has targeted media professionals. Two years ago, during Operation Pillar of Defense, it conducted an air strike against a media compound in Gaza City, damaging the offices of several outlets, including RT Arabic. Israel justified the attack at the time by claiming that one of the two damaged buildings was a communications center for Hamas.